The end of a Tekken 7 tournament has sparked some wild speculation about what, exactly, a trophy plaque says. When the winners got on stage at South East Asia Major last Sunday, the tournament organizers handed the first-place cup to Byeong “Qudans” Mun Son. Then, they told him to turn it around so the plaque couldn’t be seen. Meanwhile, third-place winner Kim “JDCR” Hyun Jin kept reaching for the trophy, perhaps to turn it around… or to claim it for himself. At least, that’s what the Twitch chat thought during the event’s livestream, with many fans erupting into trophy conspiracy theories. One user named EvilDogGames asked, “Is JDCR written on it?” Several other fans echoed this claim and posted it elsewhere, leading to a widespread rumor that South East Asia Major had printed JDCR’s name on the trophy in an assumption that he would win. The video doesn’t provide a clear shot of the trophy plaque, so there’s no way to prove this theory wrong. None of the tournament organizers or participants have clarified what the plaque said, either. If you ignore the fact that the other trophies for the event didn’t include a player’s name, then, sure, this conspiracy theory is 100% plausible. Tasty Steve also denied the rumors about JDCR’s name on the trophy by tweeting, “anyone who believes this… it’s NOT true,” and, later, “Lol I was looking directly at it [the trophy]. You’re going to tell me im lying now?” When asked what the trophy did say, though, Steve didn’t clarify. He also didn’t respond to Compete’s request for comment before press time. The bottom bold text probably says “Champion,” like the other event trophies. However, the game title text looks way too long to say Tekken 7. It looks like it might even say Marvel vs Capcom: Infinite… or perhaps it just says “JDCR” five times in a row. Or a misspelling of Tekken 7 so egregious it takes up the entire width of the plaque. 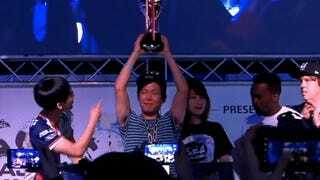 In any case, Qudans’ first-place trophy does not have his name on it, or anyone else’s name. Unless either JDCR or Qudans decides to change their names to “Tekken 7 Champion,” but they should probably wait until the Tekken World Tour finals wrap up before setting that in stone.